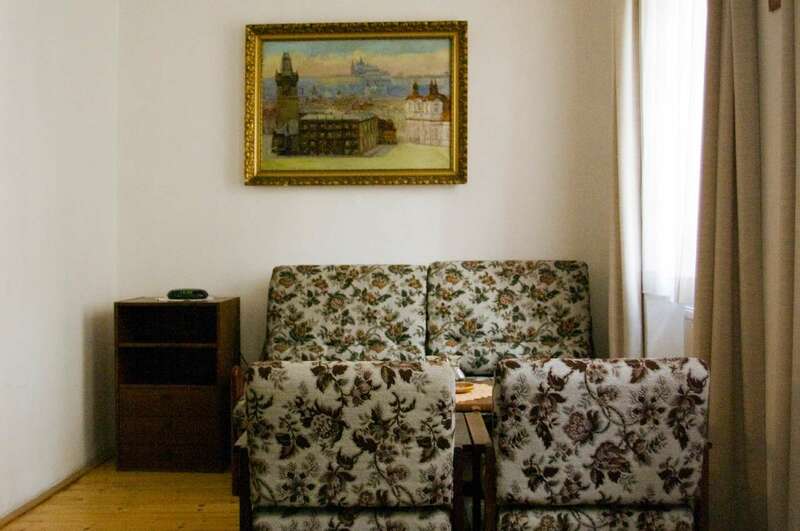 During the times of your rest from all the wandering around Prague, let the spirits of old baroque masters, whose craft gave Pension Dientzenhofer it’s current face, whisper of their ancient tales. 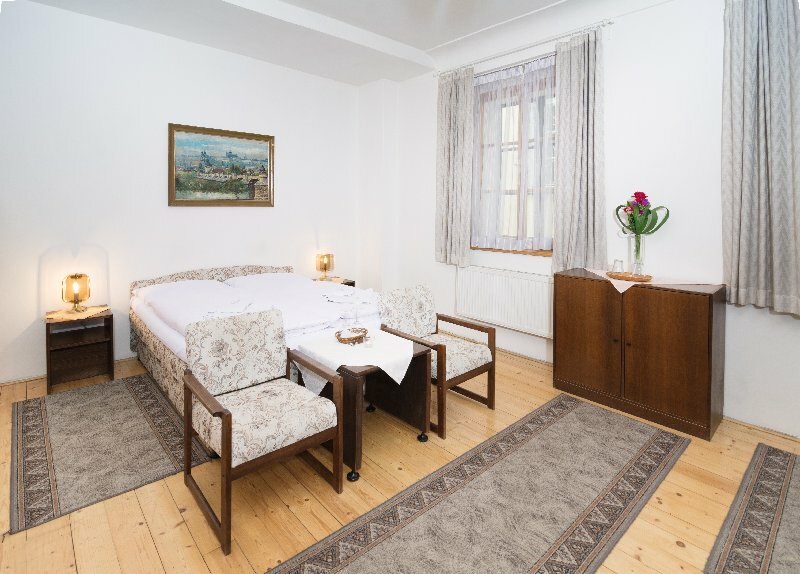 Dientzenhofer is a small family pension located in the historic center of Prague, no farther than 5 minutes by foot from famous Charles Bridge. Pension is open all year round and offers accommodation to individuals as well as to smaller groups – together with plenty of additional services. In case you or a member of your family suffers from reduced mobility, pension Dientzenhofer poses an ideal place for spending your holiday. We are equipped with barrier-free entrance and interior, as well as specially adapted rooms. A showcase of Prague’s baroque architecture. 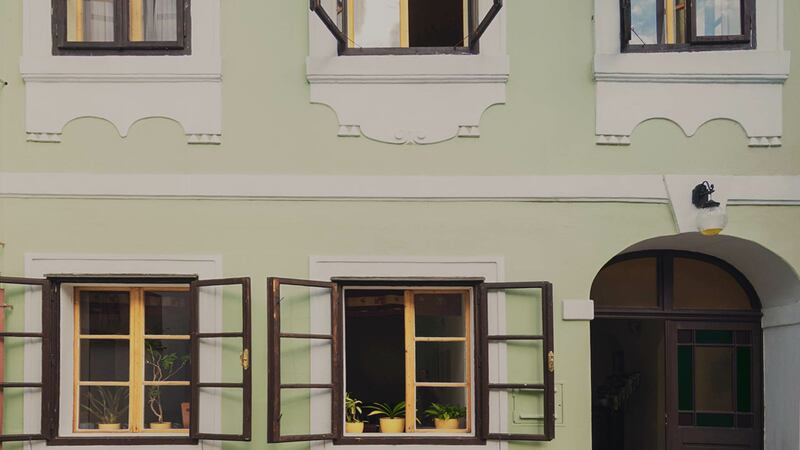 There is no house in Prague and maybe in the world, that would carry the touch of such personalities of baroque architecture, as pension Dientzenhofer. 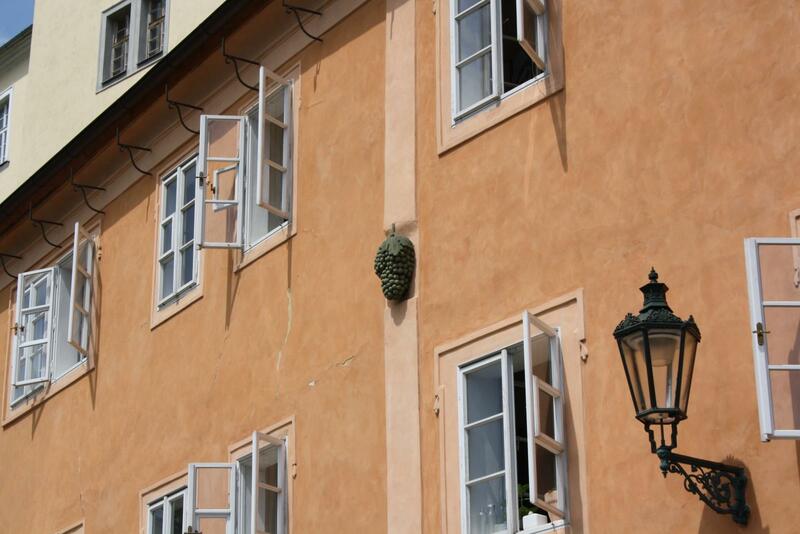 Its history dates back to year 1627, a very important year in its existence is then 1653, a year in which an austrian city of Landl born architect Johan Georg Aichbauer married into the house. Along with him, a baroque genius loci came into the house, which over the centuries, generation by generation, in wordless agreement with the house’s inhabitants worked to create the typical atmosphere of the building and its surroundings. Indeed, it almost feels like the house itself somehow beckoned the greatest architects and builders of it’s times to come and let themselves be enchanted by his spell. How else can we explain that in the house there were born, lived and or died Jan Jiří Aichbauer, Kryštof Dientzenhofer, his son Kilián Ignác Dientzenhofer, Josef Löffler and Anton Haffenecker. All those have heard the calling and bound a part of their lives with the house in silent, but the more prolific dialogue, fruits of which we can taste until today. Pension Dientzenhofer is a birth house of Kilián Ignác Dientzenhofer, which justly considered on of the greatest baroque architects of his times. Dientzenhofers were a famous family of builders and architects of high and late baroque of 17th and 18th century. Two of them – father Kryštof and son Kilán Ignác – became front co-creators of czech baroque. Their buildings help to create panorama of Prague and many other Czech towns and draw attention of tourists from all around the world. 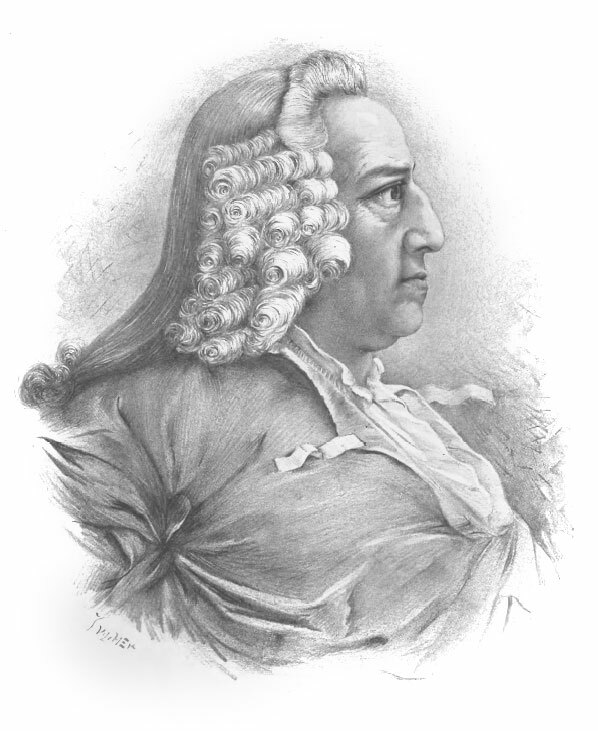 Kilián Ignác Dientzenhofer (1689-1751) designed and built more than 200 buildings. He worked for church orders, especially for Benedictines, Jesuits, Czech crusaders, Augustinians, Capuchines of Hradčany, Ursulines, but also worked for secular institutions (he was court builder and senior fortress builder) and eminent aristocratic families. Most impressive about his work is his ability never to repeat itself – each and every creation of his was somehow new and original. Diezenhofers, both father and son, were not only builders od stately churches, monasteries and palaces, but also lots of smaller building around Czech lands. All those works of art represent the pinnacle not only of Czech baroque architecture, but also baroque in general. If you decide to visit us, you will have a chance to see a lot of them, as they are located in the near vicinity of Pension Dientzenhofer. Last reconstruction of considerably devastated house of Kilián Ignác Dientzenhofer was done by company IKA s.r.o. in the years 1991-1993, by the project of ing. arch. Stanislav Novotný. This caused the house located in protected cultural property of Prague’s Lesser side to miraculously escape the demolition, that was already set in motion. Complete reconstruction delicately perserved the house’s original baroque nature. Object was repaired and rebulit to serve as barrier-free pension and base of IKA s.r.o. company. Also, the parking spots, entrance atrium and garden with the view to Kampa park and river Čertovka were adapted, so that it can be easily used by the people with limited mobility, even those using a wheelchair. Pension’s and Ika s.r.o.’s workers are specially trained to handle the needs of such clients. Five rooms/apartments are specially equipped to meet their needs, as well as the dining facilities and common area. 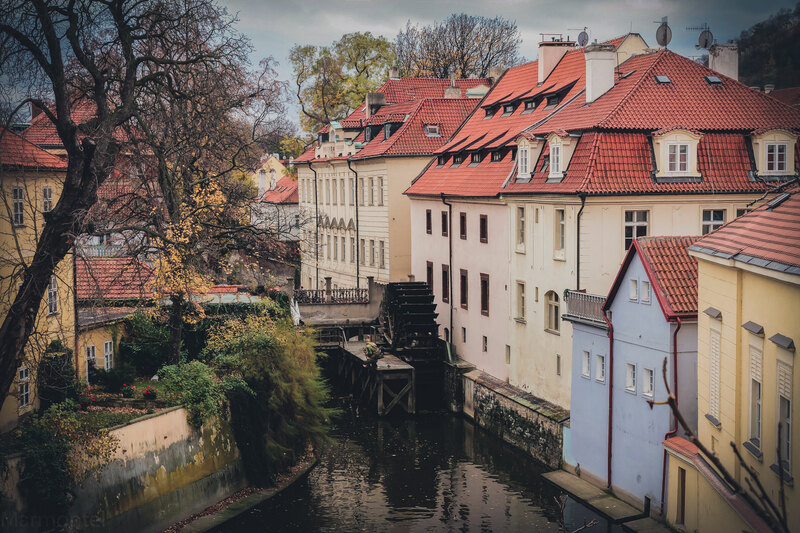 Pension also provides specially adapted transfers from and to the airport or bus/train station and tours with accent to barrier free sights, cultural and sports events and even trips outside of Prague. A matter of course is a service of mechanic and electric wheelchairs, renting of scooters and additional tools or devices. We also offer – in case of need – professional medical, psychological and physiotherapeutical aid. During devastating floods in August of 2002, the house was flooded to the height of almost 3 meters. Completely flooded was the basement, engine room of hydraulic elevator and whole ground floor, including ceilings and staircase. Water reached the level of first floor, which was considerably damaged too, as well as the garden. Despite that, thanks to the modern laser based technology, it was possible to repeatedly dry the whole place, repair it and newly equip, so that in the half of October 2002, live trials were initiated. Final repairs of facade of the house was due to technical difficulties competed no sooner than during the years of 2003 and 2004. Situation after the flooding is reminded by the photography exhibition located in the hallway of the building. Breakfast is served in a form of buffet in pension's dining facilites, with offers of sweet and salty dishes and it is served from 7.30 to 10:30 in the morning. Should you be leaving us outside of breakfast hours, it is possible to order a breakfast package to go. In the area of reception there is a lockable storage room, where you can safely put your luggages or valuables. We will be more than happy to accomodate your well mannered pets together with you, with no extra fees charged. Our reception is open 24/7 a our personal will be more than happy to help you with anything you may need, be it printing tickets and boarding passes or anything you might be curious about. If you need transfer anywhere in town or somewhere else by taxi, our receptionist will be able to find the best solution for you. Do you want to hold small celebration, organise small banquet during your stay in our hotel? Just contact our receptionst to arrange details. Do you need to wash your dirty clothes or just iron your shirt? We are happy to help you with it. Double room on the ground floor, with barrier free acceess, furnished in classic style, yet providing modern comfort. There are two separate or joined beds. Room has private bathroom with disability access, equipped with shower enclosure suited for the needs of people with limited mobility, basic toiletries and hairdryer. In room, there is also a TV, safety deposit box, telephone. Room windows are facing quiet garden. Luxury double bed room, with barrier free access, located on first floor. 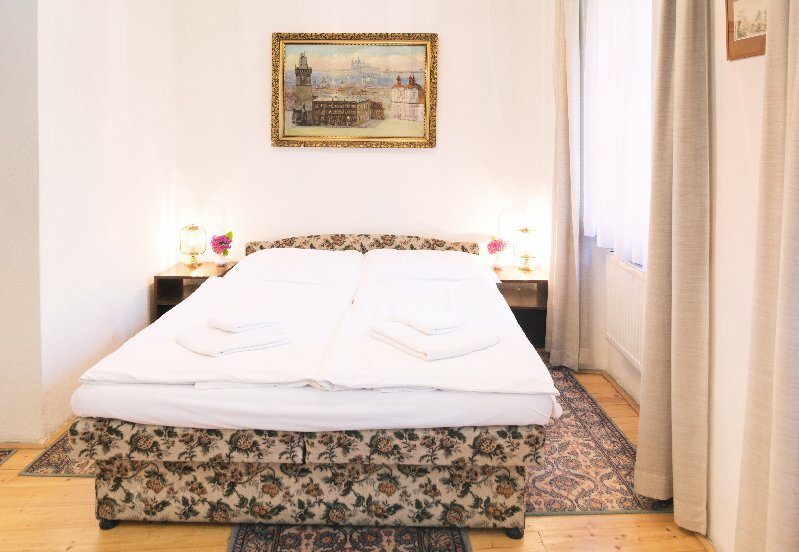 The room is furnished in classic style, yet providing modern comfort. It is equipped with double bed and private bathroom with basic toilletries, hairdryer and shower enclosure with disability access. In room, there is also a TV, safety deposit box, telephone and free WiFi connection. Room windows are facing quiet garden. Adding extra bed is possible for a fee. Quiet double room, with barrier free access, is located on first floor. It is furnished in classic style, yet providing modern comfort. There is a double or twin bed and private bathroom with basic toiletries, hairdryer and shower enclosure with disability access. In room, there is also a TV, safety deposit box, telephone and free WiFi connection. 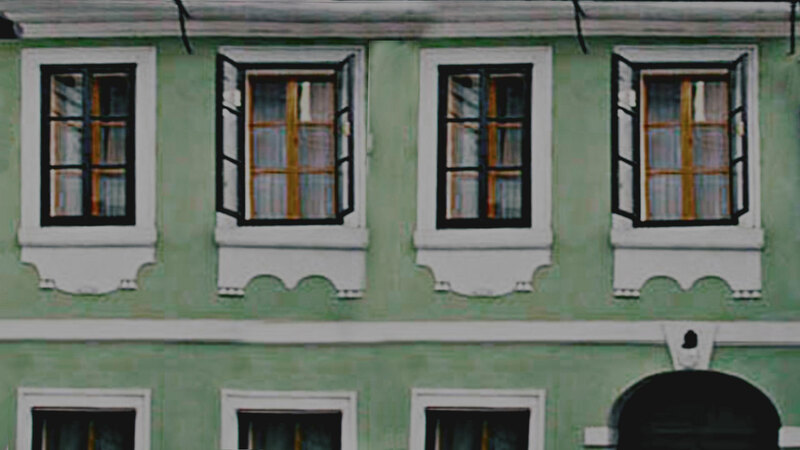 Room windows are facing quiet picturesque street. Adding extra bed is possible for a fee. Family suite with one double bed and one single bed in two bedrooms. It is located on first floor and provides barrier free access. 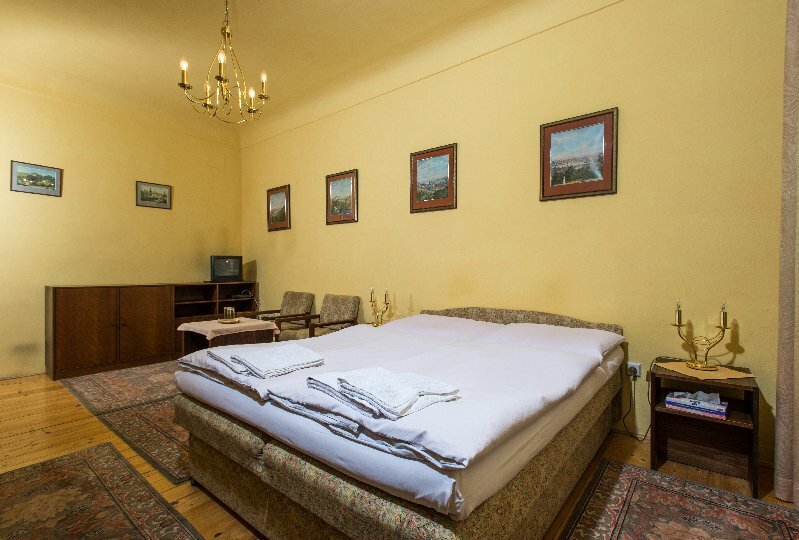 Both rooms are furnished in classic style, yet providing modern comfort. There is a private bathroom with basic toiletries, hairdryer and shower enclosure with disability access. For your comfort there is also a TV, safety deposit box, telephone and free WiFi connection. Room windows are facing quiet atrium. Adding an extra bed is possible for a fee. A beautiful family suite with two bedrooms each equipped with two beds, located on the first floor of the building. It is furnished in classical style, in which aesthetics of ages long passed by meet comfort of modern times. The gothic arches or beautiful wooden beams ceiling will remind you of the lives of rich townsmen of the old. In the suite there is a private bathroom equipped with free basic toiletries, hairdryer and shower enclosure adapted for the needs of people with limited mobility. For your comfort there is a TV, safe and a phone. Windows facing a quiet courtyard and a park will guarantee that you will spend your holiday in a calm and peaceful environment. Adding an extra bed is possible for a fee. 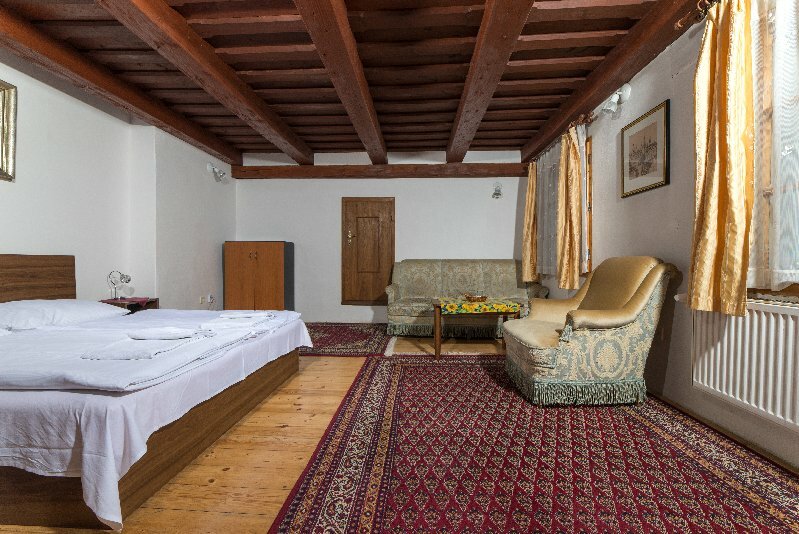 Beautiful family suite with two interconnecting bedrooms equipped with two and one bed, located on the first floor of the building. It is furnished in classical style, in which aesthetics of ages long passed by meet comfort of modern times. 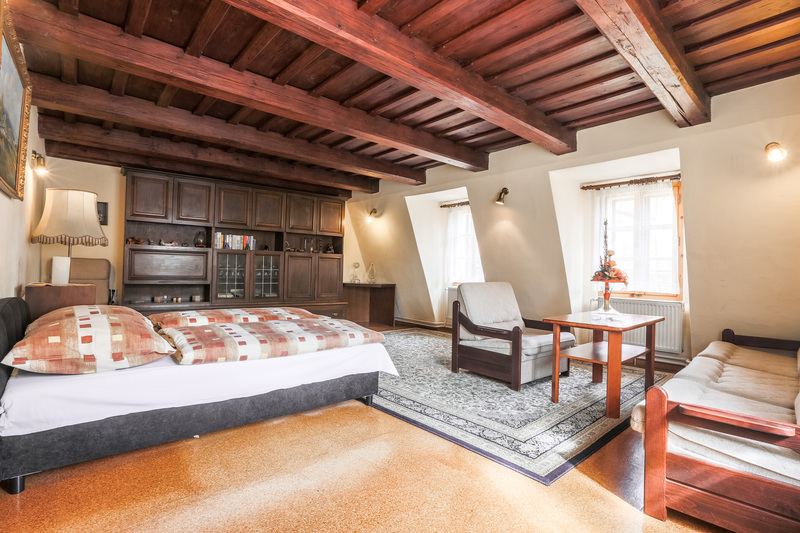 A ceiling with wooden beams will remind you of the life of higher class townsmen of the old. In the suite there is a private bathroom with free basic toiletries, hairdryer and a bathtub. For your comfort there is also a TV and a phone. Windows facing quiet atrium will make sure that you will spend your holiday in nice and calm environment. Adding an extra bed is possible for a fee. Luxurious double bedded room with a king size bed, located on the second floor of the building, but still accessible barrier free. It is furnished in classical style, in which aesthetics of ages long passed by meet comfort of modern times. 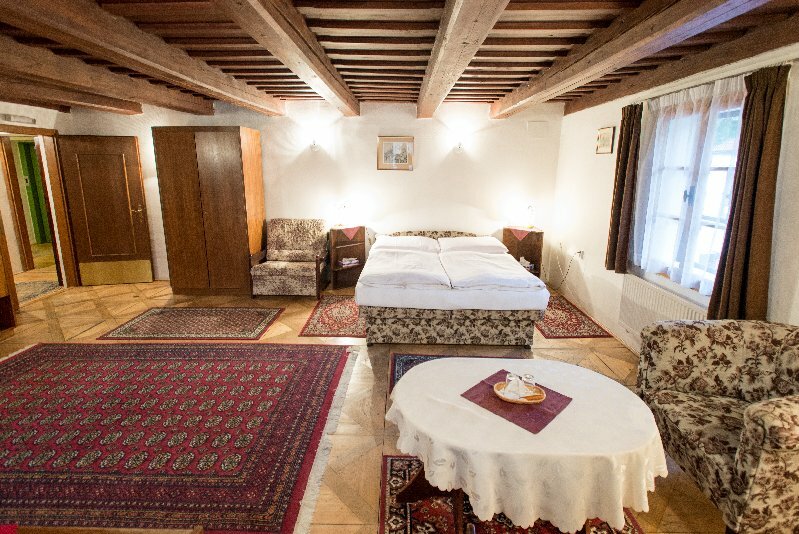 Especially beautiful wooden beams ceiling and decorated parquet from 18th century are worth your attention. It is equipped with private bathroom with free basic toiletries, hairdryer and shower enclosure adapted for the needs of people with limited mobility. For your comfort there is a TV, safe and a phone. Windows facing a quiet atrium will guarantee that you spend your holiday in calm, soothing environment. Adding an extra bed is possible for a fee. Double bedded room with barrier free access located on the ground floor, furnished in a classical style, where aesthetics of ages long passed by meet the comfort of modern times. 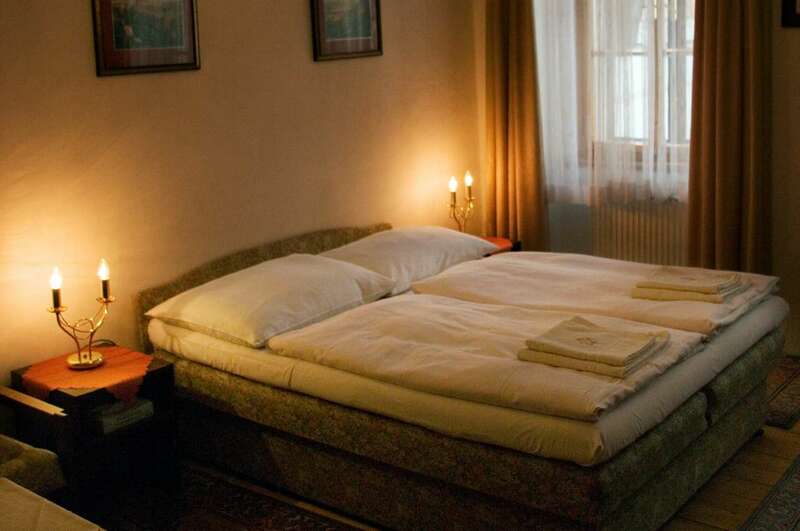 It is equipped with a king-size bed and own bathroom with free basic toiletries, hairdryer and a bathtub. For your comfort there is a TV, safe and a phone. Windows facing quiet street will guarantee your privacy and ensure that you enjoy a calm holiday. Double bedded room with furnished in classical style, in which the aesthetics of ages long passed by meet comfort of modern times. Available in both twin and double variant, it is equipped with own bathroom with free basic toiletries, hairdryer and shower enclosure adapted for the needs of people with limited mobility. For your comfort there is also a TV, safe and a phone. Windows facing quiet atrium will guarantee your privacy. Adding extra bed is possible for a fee. 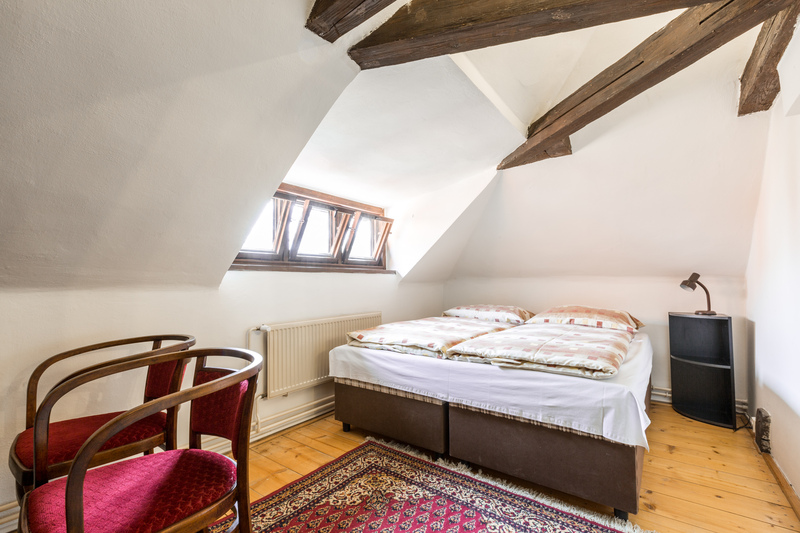 Beautiful attic double room combines aesthetics of ages long passed by meet comfort of modern times. It is equipped with a double bed and has a private bathroom with shower, free basic toiletries and hairdryer. 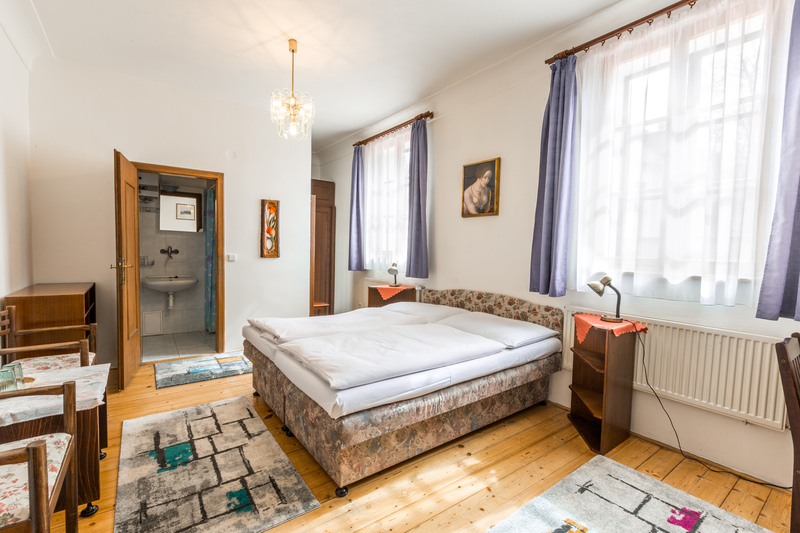 The location and orientation of the room offers views of Čertovka, Kampa and Vltava. Double bedded apartment on the second floor furnished in classical style, in which the aesthetics of ages long passed by meet comfort of modern ages long passed by meet comfort of modern times. In the apartment you can find fully equiped kitchen and office room (computer, printer, scanner etc.). There is also private toilet and bathroom with basic toiletries and hairdryer. For your comfort there is also a TV, safe and a phone. Windows facing quiet garden will guarantee your privacy. Adding extra bed is possible for a fee.